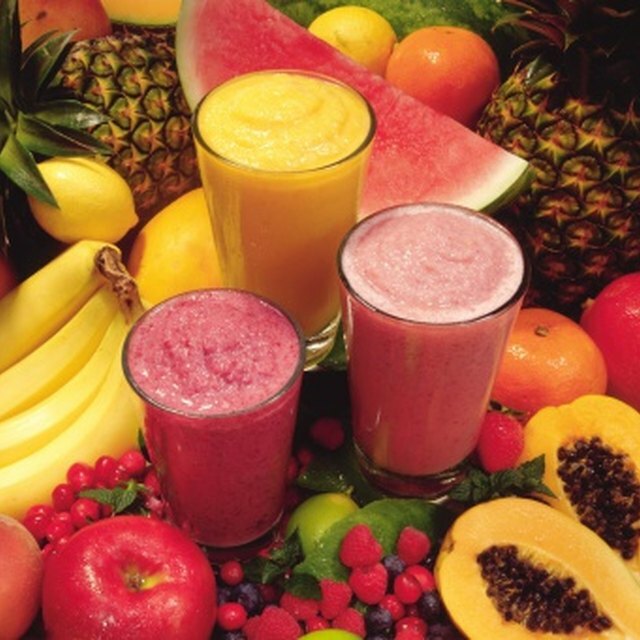 A smoothie should be thin enough to drink through a straw. 2 What Types of Fruit Can You Mix With Milk Kefir? Combining blueberries, lemon yogurt and cinnamon with creamy almond milk makes for a drink that tastes like blueberry pie but is acceptable for breakfast. Give your drink concentrated flavor by using frozen blueberries or freezing fresh blueberries on a baking sheet for an hour or so. Frozen berries take the place of ice cubes, making your drink frosty without adding water. Scoop the blueberries into a blender. Add the yogurt, milk, honey and cinnamon. Put the cover on the blender and blend on "high" for about 30 seconds. Turn it off and remove the cover. Scrape down the sides of the blender to make sure all the ingredients mix evenly. Blend for another 30 seconds. Pour the smoothie into one large glass or two small glasses. Make a berry-filled smoothie by combining the blueberries with 1/4 cup each of frozen raspberries and strawberries. Alternately, increase the drink's smooth texture and sweetness with one small banana or 1/2 cup of frozen banana slices. Add the juice of 1/2 lemon to give your smoothie a tart edge. Boost the nutritional value by adding a few handfuls of washed spinach or kale. A scoop of peanut or almond butter provides protein and creaminess. Stir 1/2 cup of granola into a half-filled glass of smoothie to make a breakfast that will keep you full all morning. Eat this smooth-and-crunchy concoction with a spoon. A single-serving smoothie is quick and easy to make, which is good news because the concoction doesn't refrigerate well. A leftover glass will separate and take on an unappealing brown tint in the fridge. If you do find yourself with more blueberry smoothie than you can drink at once, try this tip from The Kitchn -- freeze the leftovers in ice-cube trays. Place several cubes in a glass and let them thaw for an hour or two, then drink and enjoy. Alternately, munch on the cubes as a snack on warm days.